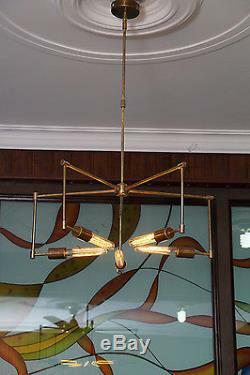 Mid century 5 arms modern brass chandelier. Brass patina edition light bulb. Beautiful Vintage inspired 5 brass arms light patina antique brass chandelier ready to hang in your living room, dining room, hall, or foyer. A complete set including fixture, ceiling canopy and installation hardware. Perfect addition to your home decor and easily customized to your needs... Diameter= 26" Hangs 35" down from the ceiling (measured to bottom of fixture not including bulbs). All dimensions can be adjusted to suit your needs though. Great craftsmanship and is in excellent condition. 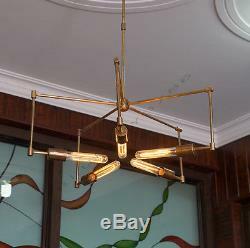 It is perfectly sound, and sports incredible old brass patina antique finish to match the light. 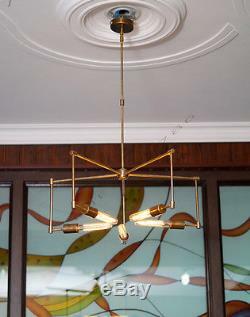 These extendable brass chandeliers will light any gallery or workshop with a modernistic ambiance. 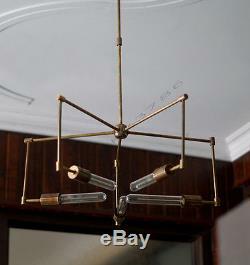 Beautiful Industrial brass vintage Diy pendant chandelier light, made with quality parts. A complete set including pendant, brass ceiling canopy and installation hardware. G reat craftsmanship and is in excellent condition. It is perfectly sound, and sports incredible old antique patina brass to match the light. These extendable ceiling chandeliers will light any gallery or workshop with a modernistic ambiance. These pendant lamps individually handcrafted from India. Made of brass in patina antique finish. (color of chose are available) - Fixture measurements is : 26" x 26" x 35 total height. 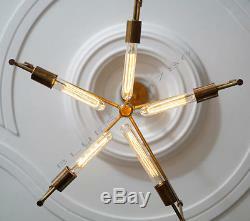 It takes 5 regular E27 tubular spiral bulb (not included). No business & personal checks accepted. BlueSky (bluesky3786) is the premier nautical collection shopping destination, providing best quality items. We offer wide range of Nautical Items, Home Decor Items, Roman Replicas & Brass Art Ware collection. We would like to help you find the perfect items! Not only we have some of the best quality nautical collection but we have the most competitive prices around. Sign up for our newsletter and receive the latest news. On new items as well as exclusive discounts! Were more than just a retail pit stop on the web! We are here to serve you!! We strive to provide you with the best possible service. The way we can measure our success is by your. Feedback and how often you come back and recommend us to family and friends. We would like to also thank. APO / FPO Military Addresses, Po Box address does not accepted by our courier service. Please note that - depending on your geographic location - not all methods are available. Make sure to select the appropriate method during check out for your location. International Buyers - Please Note. We are not responsible for any custom/duty apply on parcel. 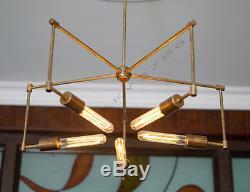 The item "Mid century 5 arms modern brass chandelier brass patina edison light bulb" is in sale since Wednesday, May 6, 2015. This item is in the category "Home & Garden\Lamps, Lighting & Ceiling Fans\Lamp Shades". The seller is "bluesky3786" and is located in ROORKEE, UTTARAKHAND. This item can be shipped worldwide.